Fiber Flux: Free Crochet Pattern...Bamboo Lace Headband and Necklace! 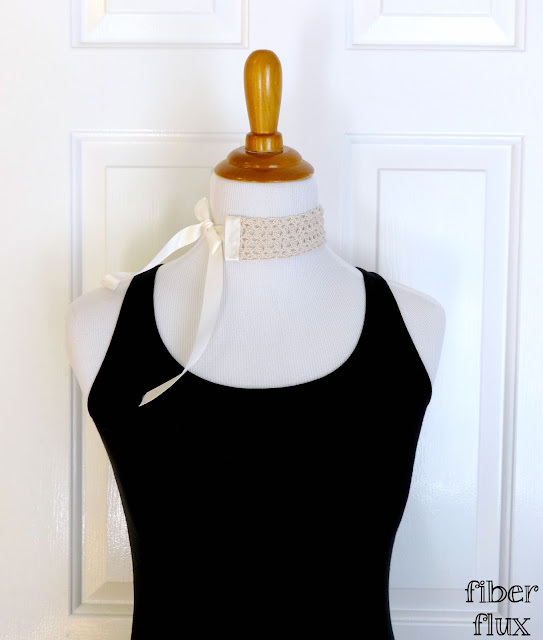 Free Crochet Pattern...Bamboo Lace Headband and Necklace! When I first designed the Summer Reading Bookmark, several of you asked for a similar headband version...thanks so much for your requests! This lacy number can be worn two ways, either as an elegant headband or as a sophisticated necklace. Worked up in naturally beautiful bamboo, it is finished off with satiny ivory ribbon. Ribbon ties are cut to size for best fit. Repeat row 2 until piece measures 10 inches as shown (or desired length). Weave in all ends. Cut two pieces of ribbon each measuring between 18 and 24 inches long (you'll trim later for a perfect fit, but it is a good idea to make them a little bit longer). 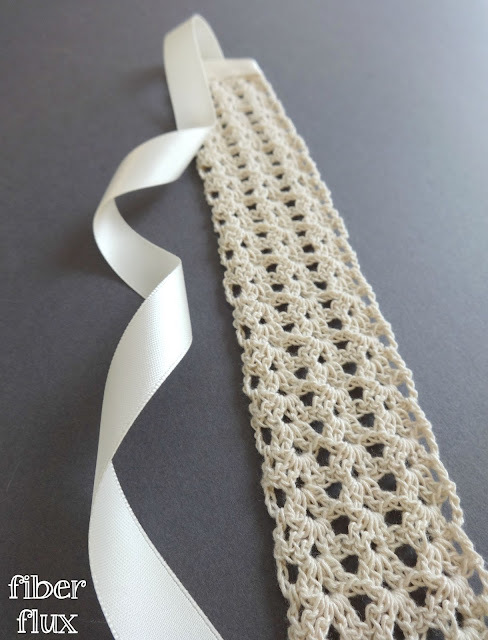 Cut two more pieces of ribbon each long enough to wrap around each end of the lace. 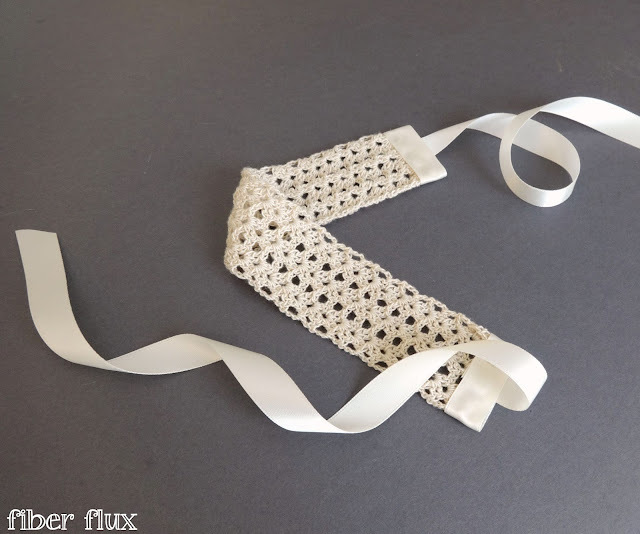 Using glue (hot glue or fabric glue), glue a long strand of each ribbon to either end of the lace strip. Be sure you are just gluing it to the very edge. Wrap the ribbon around the ends and glue to finish off the ends. Use glue sparingly to prevent any wrinkling of the ribbon...a little goes a long way! Allow glue to completely dry then trim ribbon ties as needed for best fit. 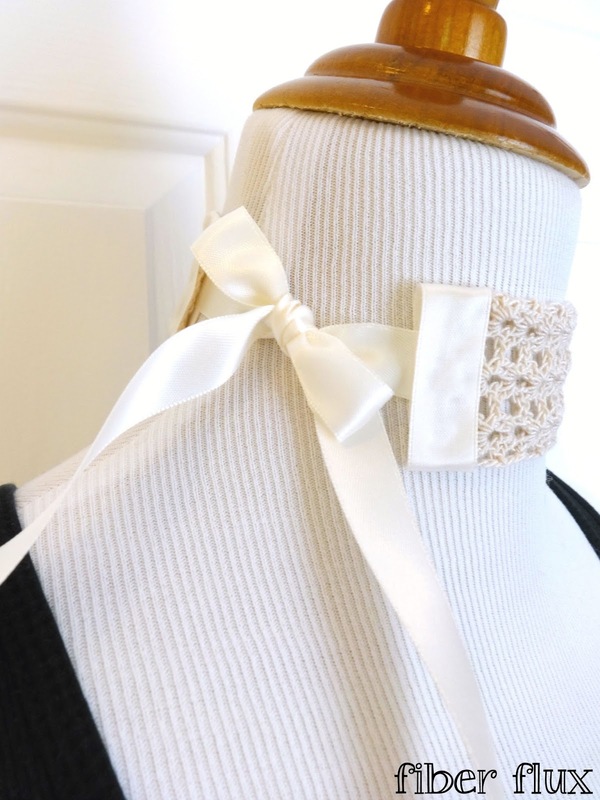 If you prefer, you can also sew the ribbon on with a needle and matching thread.